Like what said in this post, you may have a similar situation to sort out your MP4 videos. Do you still have trouble in throwing surplus clips away? Congratulations. Now you are at the right place. Here we will show you 8 free MP4 video cutters for your kindly reference. You can get more detailed information about each one by jumping to following parts. 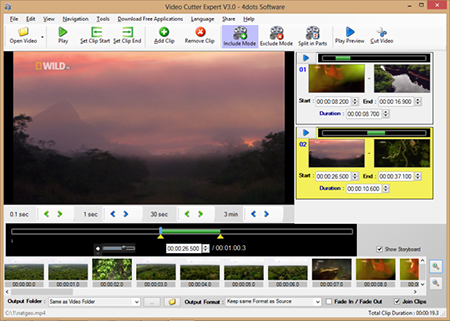 As it name suggests, Free Video Cutter Expert is an excellent video splitting program that do well in dealing with several of video files effortlessly. If you are looking for a full-featured MP4 video trimmer, it can be a good choice for you. With it, you can manage your MP4 videos professionally and leave out unwanted segments easily. Nearly all popular video formats are available, for example, MP4, WMV, FLV, AVI, MPEG, MOV, MKV, 3GP, VOB and SWF. What's more, you can split your MP4 videos into equal length or equal time as you please. To let you preview the original video and destination file, it shows you a clean storyboard and play each one for you. Of course, you can add fade in or fade out effect to make the video better. When the whole splitting process is completed, Free Video Cutter Expert will assist you to shut down, sleep, log off or hibernate your computer. It can be set based on your need. With a lightweight and tidy interface, Avidemux is truly easy to use. It can let you cut your MP4 videos into small fragments. With the exception of this format, you can also utilize this handy tool to trim other video files, like DivX, MPG, FLV, MOV, etc. Any video you import can be encoded flexibly. Moreover, not only video but also audio is well developed with filters, which can enrich your destination videos. Though Avidemux can play the added MP4 video file for you, it comes without an essential timeline. Hence, you will feel it is a bit hard to select a precise cutting portion. Frankly speaking, this is also the reason why some users give it up. However, if you need, no matter which operating system you use, it can work for you. 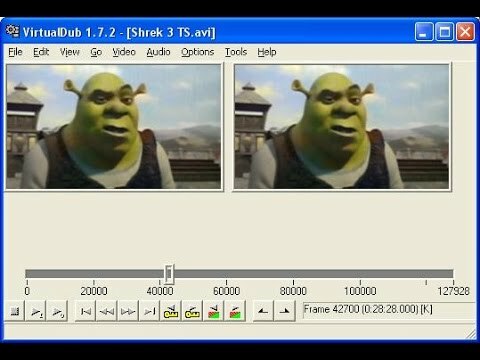 As a fairly simple video trimming tool, Cute Video Cutter can be extremely used to shorten your large MP4 videos. With lossless compression, it is ideal for helping you remove unnecessary portions and output it in high quality. Aside from MP4, it also has powerful capability to process more videos in different formats, such as AVI, MPEG-1/2, SVCD, VOB, DAT, ASF, WMV, DivX, MOV, M4V, 3GP, SWF, FLV, MKV, etc. Besides, any popular device can also be chosen, including iPhone, Zune, BlackBerry, Apple TV, etc. This tool facilitates you to decide a cutting area exactly. You can slide the controller to a rough point and then set exact time manually. 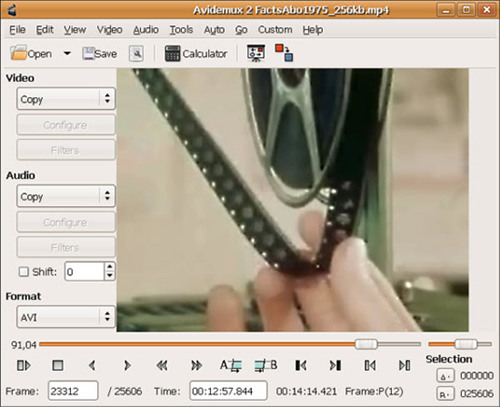 Once you have generated more than one small clip, this MP4 video cutter will show it to you. What you need to do is to simply hit the "Preview” button. Additionally, it also enables you to decide output size, change storage location, save images, etc. Requiring no installation of any desktop app, Video Toolbox can carry out an assignment for you in no time. It is capable of cropping your MP4 videos into several pieces and stripping needless parts quickly. There are a large number of video formats supported, for instance, AMV, ASF, FLV, AVI, MKV, MOV, MP4, MPG, VOB, 3GP, WMV, MPEG, etc. Video Toolbox also has options to permit you to customize video codec, bit rate, frame rate, resolution, etc, at your own will. 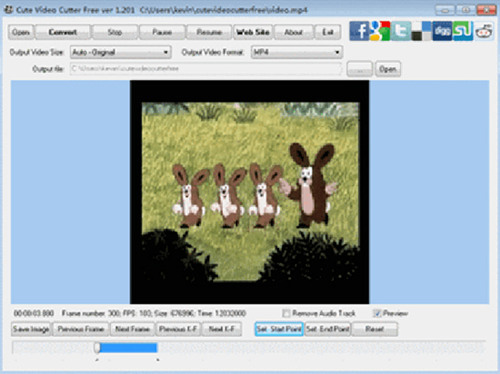 By making use of this free MP4 video cutter, you can extract audio, video or even subtitle text from the original file. Furthermore, it also authorizes you to take snapshots, add text watermark and create thumbnails. With this outstanding tool, your MP4 video files will be eye-catching and organized. When adopt Movica to split your MP4 video files, it will show all necessary options in your sight. As a totally open source, it is able to manage your MP4 videos in fast way. 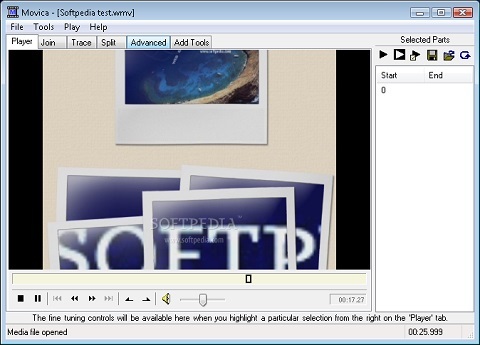 Aside from this format, it also supports editing videos in the form of AVI, WMV, FLV, MPG, RM, etc. Well arranged with multiple shortcuts, it makes video-editing and file-managing easier. As long as you need, it can also give you an access to join several clips together. Keep in mind that sometimes, it will show wrong instruction to you. Briefly to say, when you accomplish a cutting process, there will be a "Trace" window to display you a result, "Success" or "Failure" message. However, the strange point is that a successful task will result a "Failure" message. Thus, you have to go to check your destination files firstly. When it comes to process MP4 video files, Lightworks can be regarded as a top priority for you. Similar to other MP4 video cutters, it can offer splendid ability to cut off dissatisfying sections from a large video and leave desired portions only. Besides, it provides an intuitive operating interface, allowing you to access numerous royalty-free video and audio files. Meanwhile, the easy forthright timeline can lead you to grasp every second of your MP4 video files firmly. Thus, there is no problem for you to cut an exact region. Alternatively, you can get an wonderful chance to use both video and audio FX in real-time manner. After the splitting progress ends, you can share it to YouTube or Vimeo as well. 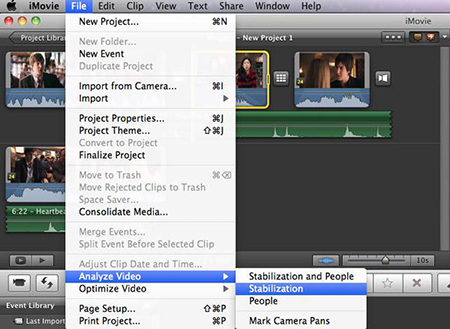 iMovie is a praise-worthy video editing tool that aims at making fantastic videos for group of users. It will bring you a good experience on cutting your MP4 videos instantly. Having imported your MP4 video to it, you can add background music, make animated titles, split unpleasing segments, etc. Surely, a high-fidelity filter can make your video more special to bring users unique feeling. Much comprehensively, you can change the speed in your way or create a Hollywood-style movie trailer. It sounds a great idea so that majority of users are fond of this marvelous feature. 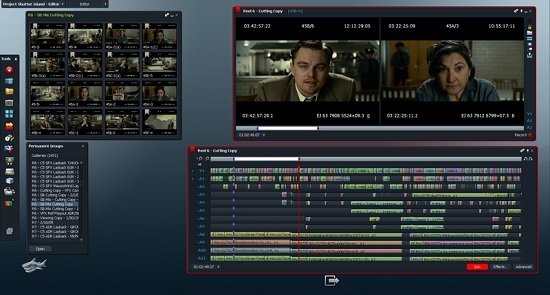 To a large extent, people also deem iMovie as a dedicated tool to make movie by themselves. VirtualDub enjoys high reputation from majority of users. It delivers a platform for you to eliminate the specific sections from your MP4 video file and can get rid of the needless pieces effortlessly. This lightweight video cutter also enables you to have a batch-processing to sort out a large number of videos, without costing too much time. Nevertheless, it is noteworthy that this compact tool can only output videos as AVI format. Regardless of this point, it can perform well in showing clean video spot for you and let you edit it in your way. The above-mentioned MP4 video cutters are specialized in splitting large MP4 video files to a manageable size. However, there is no definite answer to which is the best free MP4 video cutter. You can use whichever you like to leave out extra segments and keep favorable sections left. If you appreciate a qualified trimming program, Free Video Cutter Expert can give you all-round solutions. 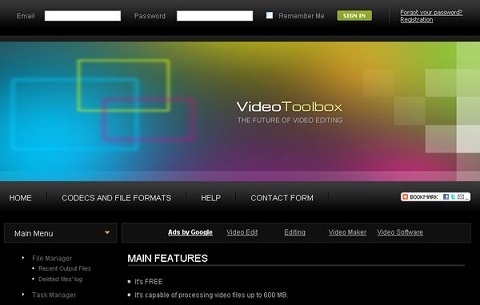 If you want to seek a straightforward way, you can try Video Toolbox, it is an open trimming freeware that can conduct cutting task online directly. Of course, apart from what we list here, you can also try some low-budget MP4 video cropper, like Joyoshare Media Cutter. It can split MP4 files at up to 60X faster speed, helping you extract audio with lossless quality. To know more, you can try its free version as well.